Carp is one of Eastern Europe's most prized freshwater fish. In the United States, it has never enjoyed the popularity it experiences from Bulgaria to Ukraine, probably because the American variety doesn't match the flavor or quality of its European cousin, where it is prepared in myriad ways -- fried, roasted, grilled and broiled. 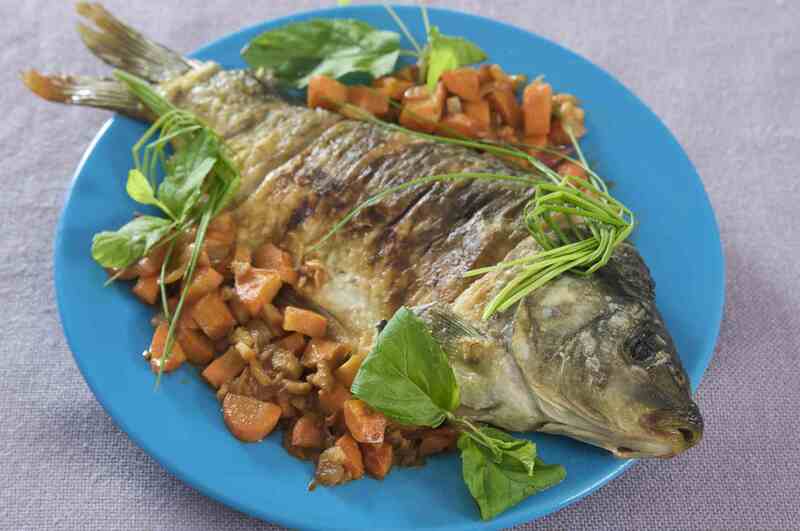 Carp takes a place of honor on the traditional Christmas Eve table of many countries, including the Polish wigilia. When carp is mixed with other white fish, it becomes gefilte fish, a favorite in Jewish cuisine. Trout is another of Eastern Europe's most popular freshwater fish that is prepared differently according to region and whim. Salmon are found in Eastern Europe's saltwater oceans and in the many freshwater rivers where they spawn. Cod, pike, and perch are all popular freshwater fish found throughout Eastern Europe. Herring are small saltwater fish that are served fresh, pickled, dried and smoked throughout Eastern Europe. They're considered lucky and occupy a place of honor at the Christmas Eve and New Year's tables. Fish roe or caviar from sturgeon are the most highly prized. Like salmon, sturgeon are saltwater fish that spawn in freshwater rivers. But as sturgeon is becoming overfished, caviar from salmon, cod and other fish is becoming increasingly common, and are a tasty alternative. Shrimp can be divided into warm water and coldwater shrimp. While this delectable crustacean is available throughout Eastern Europe these days, they really shine in Croatia on the Dalmatian Coast. Squid is a mollusk that currently can be found throughout Eastern Europe due to improved food transportation but, like shrimp and oysters, they really shine in Croatia along the Dalmatian Coast. Like shrimp and squid, oysters and mussels were virtually unknown in the landlocked countries of Eastern Europe until recent times when food transportation, refrigeration, and canning allowed them to be shipped throughout the region. The Dalmatian Coast of Croatia has a lively mussel and oyster business, although the oysters are smaller than those in the United States. Croatian oystermen brought their skills to New Orleans and other parts of Louisiana in the early 19th century and created a thriving industry with world-renowned oysters. Eastern Europeans love smoked fish. It's a product that once started out as a means to an end -- a way to preserve fish to be consumed during the winter -- turned into a love affair. Sable, also known as black cod, chubs, also known as ciscoes or ciscos, sturgeon, salmon, rainbow trout and shrimp become something entirely different when smoked. The skin turns golden or silvery and the natural oils and juices the smoking process brings to the fore make the flesh moist and succulent. They are delicious eaten as is or in some of these recipes I created with product from Calumet Fisheries. Calumet Fisheries on the far East Side of Chicago is one of the lone holdouts of this dying art. Fish smokehouses, especially in the Great Lakes region, once a dime a dozen in the early part of the 20th century, are now fast becoming a thing of the past. Get your smoked fish while you can. What Are Eastern European Nut Rolls and How Are They Made?